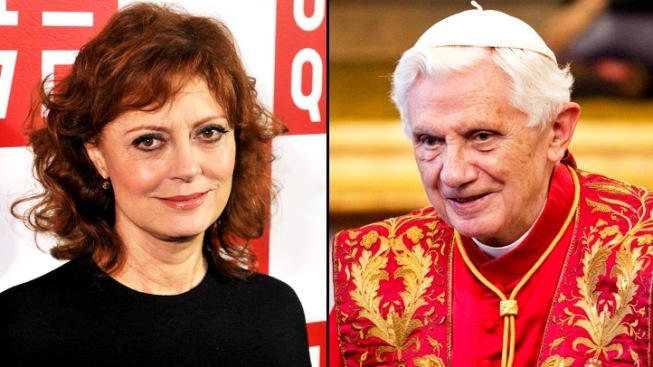 Susan Sarandon Calls the Pope a "Nazi"
Says she sent book to former pope, "not this Nazi"
Susan Sarandon branded Pope Benedict "a Nazi" in an interview Saturday. Sarandon appearing at the Bay Street Theatre at the Hamnptons Film Festival in New York Saturday, where she was interviewed by actor Bob Balaban, was talking about her 1995 film "Dead Man Walking" when she mentioned she had sent a copy of the book it was based on to the Pope. When Balaban pressed her, Sarandon repeated her remark, according to Newsday. The liberal actress also discussed Occupy Wall Street, which she visited last week in a limo on her way to the airport.